Cara Delevingne has been named as one of the richest British celebrities aged 30 and under. 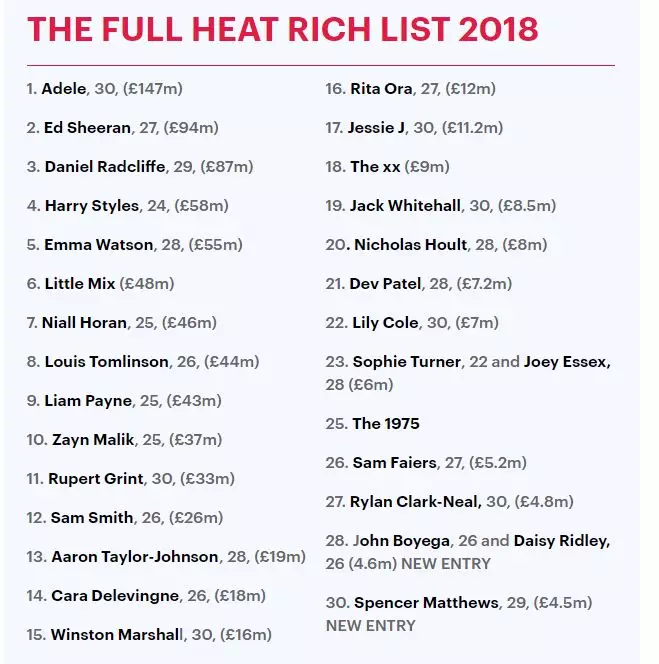 The annual rich list, which is compiled by Heat Magazine, is made up of reality TV stars, models and influencers, proving that a career in film or music is no longer necessarily the most lucrative career for young people, with Lily Cole, Sam Faiers and Spencer Matthews all included. Across the pond, the wealthiest international celebrity under 30 is Kylie Jenner, 21, who made the bulk of her $900m (£704m) fortune from her eponymous makeup brand, which is primarily marketed on Instagram. Taking the number one spot on Heat's list is Adele, who has an estimated fortune of £147.5m thanks to her flourishing music career. In fifth place is Emma Watson, whose net worth comes from a combination of high-profile acting roles in films like Beauty and the Beast (for which she received a £2m upfront fee) and the Harry Potter franchise, which is estimated to have bolstered the 28-year-old's fortune by £43m. Delevingne ranks in 14th place, with an estimated fortune of £18m that has come from a mix of the 26-year-old's work in modelling and acting. In addition to fronting campaigns for the likes of Chanel, Fendi and Burberry, the Londoner has starred in films including Suicide Squad and Paper Towns. Fellow model Lily Cole, 30, comes in at 22nd place for her £7m fortune. While the flame-haired model began her career in fashion when she was a teenager, the Cambridge University graduate has since become a passionate advocate for a number of activism projects. In 2013, she co-founded a company that uses technology to combat environmental problems. Now in its eighth year, Heat's Rich List is compiled by combining public information regarding a celebrity's accounts, endorsement deals, TV contracts and record deals.